The peer along the Mississippi River as it trails around the bend. The sign simply says 'The Rush'. 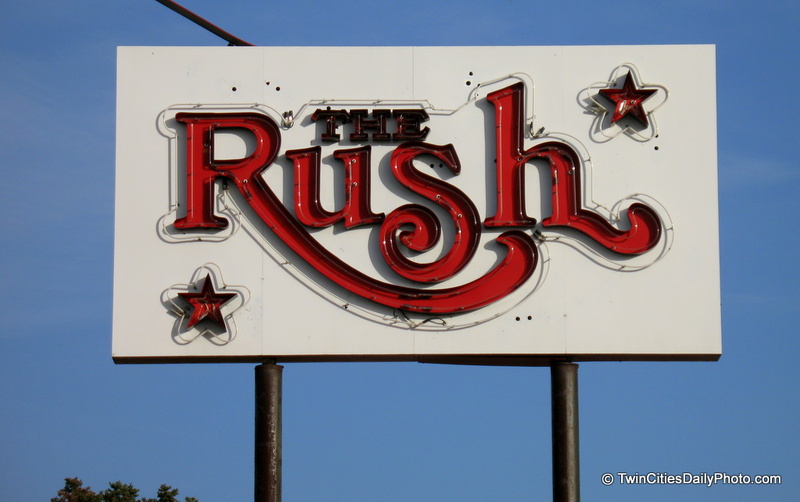 The Rush is now closed, has been for several years now. I believe it was due to not paying taxes, but I don't recall the details. I've never been able to get a night shot of the sign for this very reason, bummer. This sign has changed over the years. From my earliest findings, it was a skating rink under the Cheap Skate chain. As times changed, the skating rink was sold and the building became a night club called 'After The Gold Rush'. The locals generally called it 'The Gold Rush'. It remained this name for many years until Country became very popular in the Twin Cities. The name and format changed and became known as "Rodeo", you guessed it, it was now a cowboy bar. Or at least they tried. Several more years pass, the country craze started to simmer around here and the business went elsewhere. So the format had to change again, plus the name didn't quite fit any longer so it reverted back to something sort of familiar, thus "The Rush". As I've mentioned, The Rush has closed and the building sits vacant. I just wish I could capture it lit up one of these nights. The other day I took on my second camera repair job. This time it was the camera of long time contributor swc. His LCD screen had cracked and at times would become blank. The first camera repair job I did was my own camera. I had completely cracked the screen and it was useless. So I took on this new job with a bit of experience, but still nervous since it wasn't my own camera this time. It took me a bit to figure out all of the screws that needed to come out to allow the shell to be removed. Once I figured that out, it was a piece of cake. Getting there was a battle. All in all, it was a three hour repair job. I can put another notch in my camera repair belt as the job was a success. On my way to work the other day, midway through Newport and pull in behind the truck you see in the photo. It was driving a bit slower than the traffic was moving, but I was just about at my ramp to go from Highway 61 to Highway 494, so I slowed down and followed along behind the truck. I noticed the high stack of pallets, how could you miss them? Started looking it over a bit closer, there was straps keeping them in place and they were still attached, I was safe. So we finally make it to the ramp, which takes a very long, long curve before connecting with 494. Let me tell you, what I saw next scared the bejesus out of me. Picture this stack of pallets, truck driving around a curve, now picture two of the wheels nearly leaving the ground! I swear the truck was going to tip over. There was three or four times, during the curve, the tipping of the truck, the lean of the pallets, I was nervous as one could be. The photo doesn't do it justice unfortunately. The truck did make it around the ramp and onto 494 and a straight path. That was when I decided I needed to take a photo for the blog. I was sitting at the light where George Street, State Street and Concord Avenue all meet together. I was sitting at a light that I normally don't drive on and realized how large of a sign La Guadalupana really has. That font is massive! Anyway, this grocery store can be found in St Paul's West Side neighborhood. It's located on Cesar Chavez Street [old Concord Avenue]. A little more from the Robert Street Bridge. Most of the piers on the bridge, near the top, there is a decorative emblem of some sort or another. They are not all faces like this one shows, I guess I haven't really gotten close enough to take a good photo of the detail before. I do know some of the piers have emblems, as I barely captured one in a photo I took back in 2006 which can be seen here. What do all these symbols represent, my very brief search found nothing. Standing under the biggest arch of the Robert Street Bridge in St Paul. The blog is back up and running. After doing some more reading, I found some information that got me in the right direction to get the blog back up and running 100%. Still haven't heard anything from my trouble ticket I sent into blogger, but hey, I am good now and they can close the case. 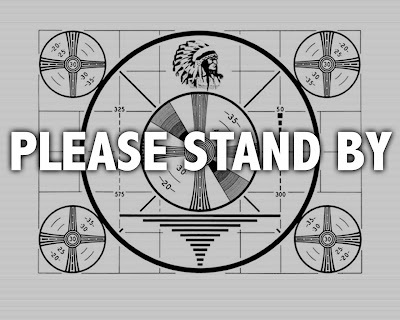 Well, so far the blog migration has not gone as expected. I've lost all of the links to my photos, as I'm sure you can see, but I do have trouble ticket into blogger. My son captured this photo, it was taken somewhere around the Minneahaha Falls. I'm not quite sure what the purpose of the outhouse looking building is, but I did notice the door is secured with two slide bolts and two heavy duty pad locks. NOTE: Twin Cities Daily Photo will undergo maintenance over the coming weekend and may be unavailable for some time. I currently publish my Twin Cities Daily Photo blog using FTP uploading to bloggers servers. 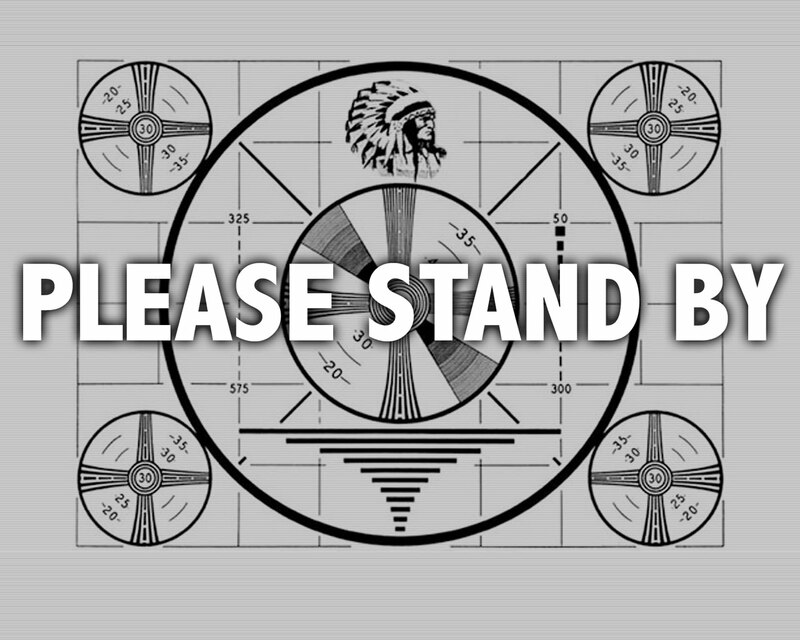 As of May 1, this updating method is no longer allowed by Blogger and my site must reside on their servers. Passed by this sign along Concord Street in South St Paul. I'm not sure what exactly this sign represents. I know if you're traveling in South St Paul, Kaposia is a very familiar name. They have Kaposia Days Festival, many stores have it as part of their retail name, so I know Kaposia is part of this area. But why the sign here, the significants of this exact location is unknown. It is a stones throw from the Mississippi River, there are bluffs above the sign. Perhaps those two factors contributed to the village residing here for 22 years? I was walking along the Mississippi River, across from downtown St Paul when I noticed the Robert Street Bridge reflected spectacularly in this window of a local bank building. This was a couple days after the peak height of the Mississippi River floods in the Twin Cites, during the spring of 2010. I'm not happy with the results of this photo, mainly due to the shadows and the suns reflection on the painted brick, but this section I was willing to post. This mural is rather large, it spans from the front of the building all the way to the back. I would probably have to stitch two, most likely three photos to capture the entire artwork. This space also doubles as a parking lot to the business, getting a full shot without any vehicles would also come into play. As for the location, I'm on State Street, just before the light at George Street on the West Side neighborhood of St Paul. A wider view showing many of the subjects from the past week. A close up of a lamp post found along the walkway, across from downtown St Paul. I'm from Minnesota, it's Grey Duck here, not Grey Goose. So I'm driving my kids to school the other day when my son blurts out, look at the ducks on the cars. We're like 300 yards from their school, so I drop them off and return to where he saw the ducks. Sure enough, the ducks are still sitting a fence and a Ford F150 while doing a courting dance of some sort. Greetings to all of the Theme Day photo bloggers viewing all of 'Red' photos. The photo I've selected comes from a metal band from England, Motorhead. 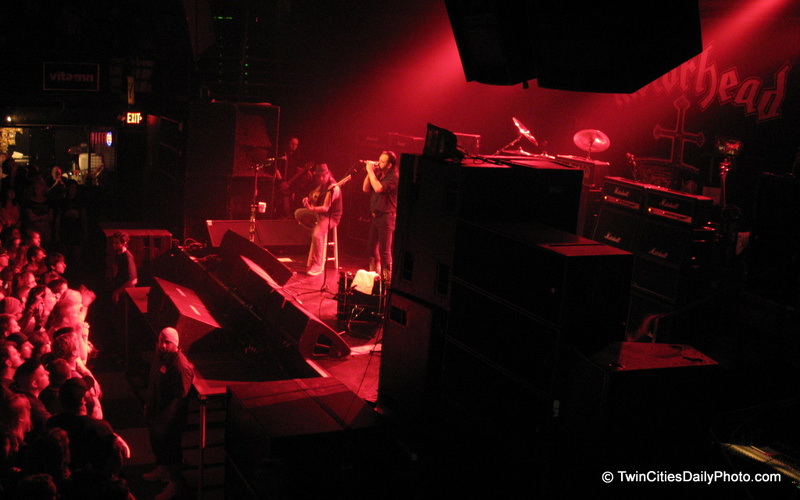 They played at the world famous, First Avenue in Minneapolis. The venue holds about 2000 people or so and can get very crowded on a night with a popular band. This was indeed a very full house during the Motorhead show.